By John Hertz: Luckily I managed to attend the memorial service for Jim Busby (1954-2016) on Tuesday June 14th. Luckily I managed enough presence of mind to say something suitable when the floor was opened. We were in the spacious brick Latter-day Saints church at 2000 Artesia Bl., Torrance, CA 90504. The service was conducted by Zack Robertson, a bishop in the LDS lay clergy. Pastors giving eulogies have the sober but perhaps inspiring duty of learning or refreshing memory about any parishioner whose life on Earth has ended. The rest of us most often need only recall people we knew well. Not only the tasks near to hand are worthwhile. Many in the room knew Jim from aerospace work, the science fiction community, or both. The memorial pamphlet began, “This death takes place in … the sunrise of a new world, a world that our beloved comrade gave his life to protect and nourish … and we will not debate his profound wisdom at these proceedings,” quoting James Tiberius Kirk. Right after the opening hymn and invocation we heard “The most important thing we can do is inspire young minds in science,” quoting John Glenn, and “Wonder is the basis of Man’s desire to understand,” quoting Neil Armstrong. Arlene Satin, Jim’s widow, told how she first met him. While in charge of Programming for a Westercon, and noticing he’d fallen off a list, she asked if he wanted to be put back on. Good deeds can be rewarded. The California Museum of Science & Industry, after Jim’s twenty years there, awarded him an honorary Doctorate in Space Science Information. He advised the Hugo-finalist film Apollo 13 and the Emmy- and Golden-Globe-winning television miniseries From the Earth to the Moon – in which he also acted: he was the Grumman fellow tapping his pencil in the fifth episode, “Spider”. That was lifelike. We were all given pencils inscribed with Jim’s timeless expression, “Sorry.” The episode, incidentally, used a real Lunar Module, built for Apollo 18. We also heard due reference to the Ancient Honorable Order of Turtles, for Gene Cernan and Walt Cunningham still alive, and in memory of Jim, Donn F. Eisele, Paul Haney, Walter M. Schirra Jr., Donald K. Slayton, John L. Swigert, Walter C. Williams, and John F. Kennedy – no questions asked. Mr. Robertson named sources he’d consulted. The first was File 770. He inquired “Is Mike Glyer here?” I answered “In spirit.” So, of course, was Jim. 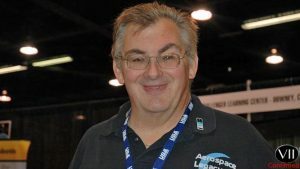 Honor him with a donation to Aerospace Legacy Foundation, P.O. Box 40684, Downey, CA 90239. This entry was posted in In Passing and tagged Arlene Satin, Dr. Jim Busby, John Hertz by Mike Glyer. Bookmark the permalink. Thanks for sharing your reflections on James Busby’s funeral. Sadly, I never met James but now with these comments I regret I never did.